Sometimes takin’ our pets to the vet can be might distubin’. It can actually be as painful for you humanz as it is for the pets! After a first trip, our curiosity disappears real quick like and then we can remember all the pokes, prods, and needle sticks we experienced there. I do alright as long as my Lady is with me, but my sister Sallie is a handful. If y’all remember ’bout a year ago when my sister Sallie visited the vet, she was downright unruly! For your pet’s health, and to make things easier on you humanz, it’s important that ya keep your pet’s stress level down. There are few things ya can do to help a pet’s stress level before, and while, you’re at the veterinarian’s office. Us pets are like kids. Pets react to their environment and the environment that you humanz create, So, ya got to give us a positive experience right before goin’ to the vet. This will help keep our stress levels down. Let us enjoy playtime and maybe give us a few them favorite treats 🙂 Make sure ya focus all of your attention on your pet durin’ this time, in order to keep their attention on things they like. Before takin’ your pet to the vet for shots, vaccinations or any other procedure, try schedulin’ a fun visit. Go in and let em check the place out. Hey, I like that receptionist lady! She always gives me an ear scratch WOOF! Most vets are open to this and will welcome you to come visit and just say WOOF. Spend only a few minutes lettin’ us sniff, walk around (on the leash of course) and get our ears scratched 🙂 This will create a good experience, and memory, for us and the next visit might not be so scary. Every visit to the vet usually includes a basic checkup where the vet and assistants are goin’ to take some time to check the overall health and condition of us. You humanz can watch how they do this, where they look, how they touch and feel us. Then, at home, make a habit of doin’ these same things. The goal is to get your dog, or cat, used to the basics of a vet visit so they associate the routine with you and comfort. Many pet owners say that their pets, me included, end up lovin’ the routine and find it calmin’ and relaxin’. Us pets can pick up on your attitude and stress levels. If you’re stressed, it can cause us to feel stress and anxiety too. Make sure that before, on the way, and while at the vet you’re stay calm and positive for your pet to see. Make sure that your interactions with your pet are all calm and focused on your pet. This will help reduce any stress goin’ into the vet and while you are waitin’ so that the other exercises you practiced will help to keep stress to a minimum. If there are certain things or experiences that increase your pet’s stress or anxiety, do what you can to eliminate them from their visits. For example, if your pet is high energy first thing in the mornin’, try for a later appointment when they are calmer. If your pet gets skittish with other pets in the same room, try to book an appointment time when the office is slower. Most of my brothers and sisters do purdy good goin’ to see the vet and I don’t mind to much. My sister Maggie tries to hide behind the chair, but she don’t give em no trouble. Sallie is just a pickle! She is an all out momma’s girl and don’t like no one else to touch her. But, if my Lady is holdin’ her, she will let the lady vet take care of her. Our vet has been takin’ care care Sallie since she was 4 weeks old, Sallie ought to know the routine by now – ya think?! There is also a problem if you know your pet doesn’t care for someone. For example, one time on an emergency, our lady vet was out of the office and the man vet tried to touch Sallie. That did not go well at all! In the end, my Lady did the doctorin’ while he told her what to do. I swear that Sallie is a tough cookie! So, my Lady knows to always try and make sure our normal lady vet is in the office for our regular visits. If you have a pet that becomes extremely stressed and anxious when goin’ to the vet, you might consider medication as a last resort. If my Lady knows that Sallie is gonna have blood work or somethin’ like that, she gets an anti-anxiety medication from the vet to give her right ‘fore they go. It helps Sallie settle down enough to make it through the visit. My Lady don’t like givin’ the medication, but it’s better on Sallie than gettin’ so worked up and her heart a beatin’ outta her chest! In the end it is the lesser of the two evils. Most of my animals are fine going to the vet and my dog even loves it (I think they are sneaking her treats) but my oldest cat freaks out every time. I really think they need to give him medications for visits. I am so happy that I have never had an issue bringing my animals to the vet! These are great tips though! These are great tips! My pets do not like going to the vet or traveling in cars. I always try to make them feel safe and calm and pay attention to their behaviors. The Vet isn’t the problem for my cat, it’s the carrier he hates. My two dogs are not so bad at visiting the vet, but my childhood dog had really bad anxiety about it! We would either have to drag him in there or carry him. Man, it was a struggle. I have found that if you remain calm, it helps them a lot. I love your first tip about setting a positive environment. Thanks! These seem like tips I ‘d like to try. My 3 year ols shihtzu has a hard time leaving the house and being around strangers. She hates the vet and anything related to it. What great advice for taking our babies to the vet. I have a Eclectus parrot and when I take him to the vet I ride with but can’t go in because of my stress level. My daughter takes him in and I am told he is just a delight to everyone there. He is just a laid back bird. Great tips for a positive trip to the vet. Thank you for your informative post, I’m definitely glad vet visits aren’t a problem for my dog! GREAT advice. Our dogs hate the vet. Thank you for your tips on stress free visits to the vet. We have two dogs we take and one gets quite anxious. Thanks again!! I’m thinking medication! 😉 Just kidding. My vet is AWESOME and makes it all super easy. Even when we just go for food or heartworm refills she comes out and plays with him. It adds to his comfort when we are there for more annoying procedures. Thanks for these great tips, Molly! They’re sure to come in handy on my next visit to the vet! 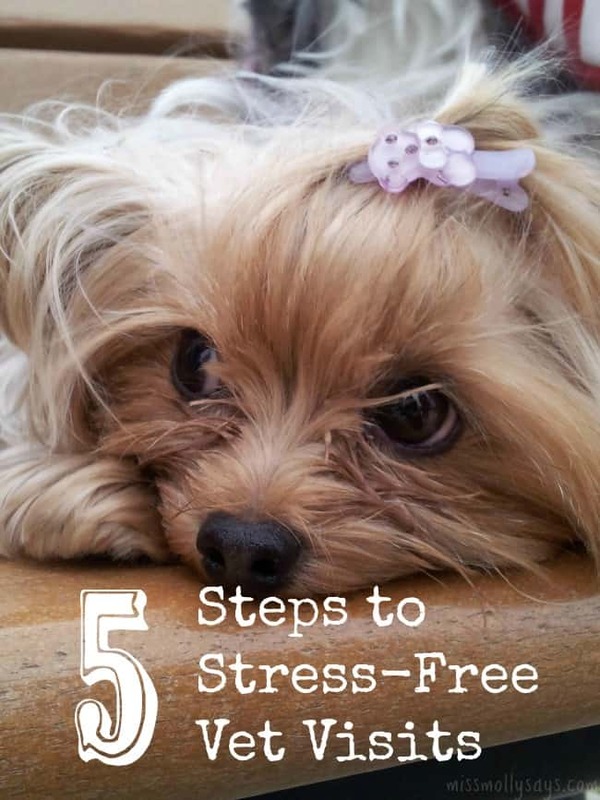 Great tips, but however not coming home with your pet is the most stress on us. Such great tips! I am taking my furbaby to the vet tomorrow, so we are certainly going to give this a try! Good advice! It is stressful for my dog and for me, too. I’ve never had any problems with my pets but these are great tips for others that do. Very informative. I like the practicing the same moves and doing your own “check-ups”. I love the idea of going for a fun visit! Very awesome idea! I also put lavender oil on a little piece of cloth and lay in in our little guys car seat. There are several E.O’s that have a soothing effect upon our fur babies. It cost pennies and the effects are priceless. Plus your car will smell great! My dog never minded the vet because she always got treats and the vet would get on the floor and play with her. I like going to the vets with my pets , it’s the one waiting room that people talking to each other about their pets.Pet owners are so friendly. Thank goodness I don’t have this issue but they are great tips. My problem is trying to get my dog out of there lol. I don’t have a problem with my Bambi and the Vet but like a typical female she just does not want to get on that scale. Great Info!! I really needed this!! the vet leaves with the dog to do x-rays or something is when we hear them cry. I have one cat that does not do well at the vet’s office. They usually have to pull out the heavy leather gloves and cat restraints for her unfortunately. I like the idea of practicing a vet visit with your pet. I agree that it’s important to stay calm during vet visits. Our pets definitely pick up on our emotions and I think it’s best to not make a big deal out of the visits since they’ll think they need to be upset.